Many of our walks will take us through land that is neither garden nor wilderness but rather the hinterland between the two, and it is in these areas that we will find the garden escapees. There are many plants, like snowdrops, that have made the leap from tame garden flower to wildflower on the run. We can use these plants as one more clue that our walk is taking us close to civilisation of some sort. Snowdrops will often lead all the way back to someone’s back garden or a churchyard. One of my favourite local escapees in early summer is honesty, whose purple flowers welcome me back to my village on many return routes. The Walker’s Guide to Outdoor Clues & Signs, Tristan Gooley. I read this at breakfast this morning and was triggered. There’s only one place around Filey that I have noticed this flower, so I hied off up Long Lane. 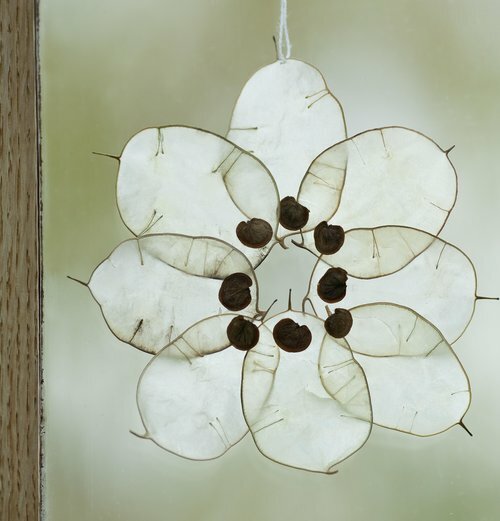 Perhaps they suggested silver coins to some gardeners, but I am more persuaded that honesty ‘derives its name from the “see-through” quality of its seed-pods’ [Anne Proctor]. In Alison Uttley’s ‘Little Grey Rabbit’ stories the pods are called ‘windows’. Walking a little further up the Lane brought me to the viewpoint of Today’s Image. The May blossom isn’t so far along this year.